Today is a great day to be alive. There have been many rumors floating around the internet of what was to become of the beloved Halo franchise after 343i took over. Many gamers were dissapointed with the outcome of Halo 4. However, with today's E3 presentation of the Masterchief Collection and Halo 5: Guardians, I think they have done more than excite old fans, but bring and entirely new community of Halo fans. First, let's discuss the Masterchief Collection HD, as it's what most of the Halo community is ecstatic about. The Masterchief Collection will be comprised of the original four Halo games; Halo: Combat Evolved Anniversary, Halo 2: Anniversary, Halo 3 and Halo 4. Remastered in 1080P, playing at a whopping 60 FPS! All four games will be playable from one (1) disc, which is easily do-able considering the original sizes of these games, and the current capacity of discs. The four games will each come with 1000 Gamescore to acquire, for a total of 4000 in total. Which is great news for those achievement hunters out there! The games (Halo Anniversary and Halo 2: Anniversary) will also have the ability to switch between the original graphics, and the remaster graphics. Just like we are able to do in Halo CE: Anniversary for Xbox 360! Which means we can enjoy the game just as it was all those years ago, with all the nostalgic feelings included. Lastly, the game will come with access to a new live action series by 343i called Halo: Nightfall. It will be available in the Extras menu on The MCC and it will premiere for everyone to watch, on 11/11/14. We heard a rumor earlier in 2014 from a Neogaf user that there was going to be a Halo 2 remake released in November. Well, it looks as if the rumors were true. However, I don't think everyone was really that excited about the fact that it was a rumor. Now that it has become truth, you better believe the hype. Out of all of the Halo games released over the years, Halo 2 probably has the largest fanbase out of all of them. To be honest, Halo 2 probably had the largest fanbase in all of console gaming and depending on how good these remakes are, 343i will become evermore popular, alongside the Xbox One. Now let's talk a little bit out what was mentioned during E3 about how multiplayer and the interfaces will work for the Masterchief Collection. There will be one disc for all the games, and a custom user interface at hand to manage your new gameplay experience. You will be able to line up missions from any of the games, and play them with your friends from this one user interface. It will also have access to new dedicated servers for the multiplayer counterparts for the individual games. With the use of dedicated servers, we will experience less lag, and little to no network manipulation, which has been seen in previous Halo games (such as the 'stand by' trick, or host booting). Each game's individual multiplayer will operate the way it previously did with optimized graphics, especially the Halo 2: Anniversary multiplayer. But what’s cool is that you may be presented with three choices that span three different games. Say, Halo: CE’s “Wizard,” Halo 2’s “Lockout,” and Halo 3’s “The Pit.” Whichever gets the most votes is the game that MCC will launch, after which you’ll be taken back to the multiplayer lobby with your friends. Longer load times may arise from this, but considering the game will be running on dedicated servers, that might not be the issue after all. For those who played Halo PC, dedicated servers loaded maps almost instantaneously, which means we could expect the same for the console versions running dedicated servers. Now that you guys are hyped about the Halo: Masterchief Collection, let us take a moment to talk about the Halo 5: Guardians Beta. When you purchase your copy of The Masterchief Collection, you will also receive a key that allows you to access the Halo 5 beta in December of 2014. The beta will of course, be a preview to the multiplayer side of the new Halo 5 game, and will most likely give us some insight about what is going on in the new story. Not much more was said about the beta, but I will update this thread if I do find any juicy information regarding the beta. Microsoft made a great move by bringing these games back. The Halo franchise has done a lot to bring Xbox to where it is today, and will most likely continue to bring the Xbox platform into the future. With this being an E3 announcement, you can expect more and more information to appear randomly as time comes to pass. Keep an eye out for more news! Halo: The Masterchief Collection will be dropping on November 11th, 2014 for Xbox One. The four games will not be featured separately on the Xbox One Marketplace; it will be one Bluray disc sold at retail price for $60.00. 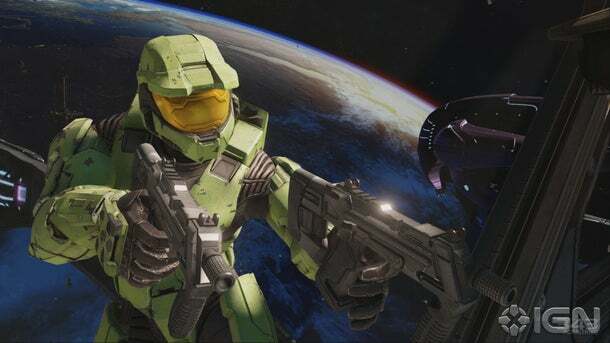 The Halo 5: Guardians Beta will drop sometime in December of 2014, and will be granted to those who purchase Halo: The Masterchief Collection. Graphical comparisons of Halo 2 and Halo 2: Anniversary can be seen HERE. Source | Thanks to Saby for the video links.